For more information or answers to your questions, please call 315 464-HOPE (4673) to speak with an Upstate Cancer Center representative. An electronic booklet about multiple myeloma from the National Cancer Institute. The booklet includes information on what multiple myeloma is, risk factors, symptoms, diagnosis, staging, treatment, second opinions, nutrition and physical activity, follow-up care, sources of support, and taking part in research studies. A detailed guide to multiple myeloma by the American Cancer Society. The guide includes descriptions of the causes, risk factors, prevention, diagnosis, staging, treatments, and what's in the research. 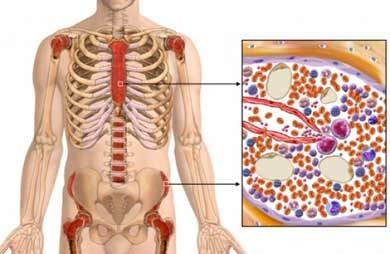 Information from the International Myeloma Foundation on the bone marrow cancer, getting the correct diagnosis, causes, tests, treatments, supportive care, transplant information, monitoring, relapse, and clinical trials. MedlinePlus search on "multiple myeloma"
Link to a search of the MedlinePlus database for health information on multiple myeloma, includes links to informative articles on myeloma, and interactive tutorials. MedlinePlus links are managed by medical librarians at the National Library of Medicine.